Vacation rental house. Sleeps 10, 4 bedrooms, 3 bathrooms. No pets allowed. 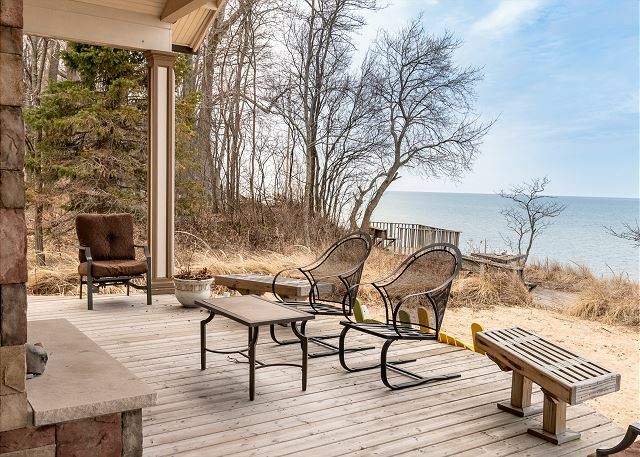 Beautiful and serene location, right on the beach. The back of the house. Deck with fire place, plenty of seating. The sandy beach and quiet waters await you. 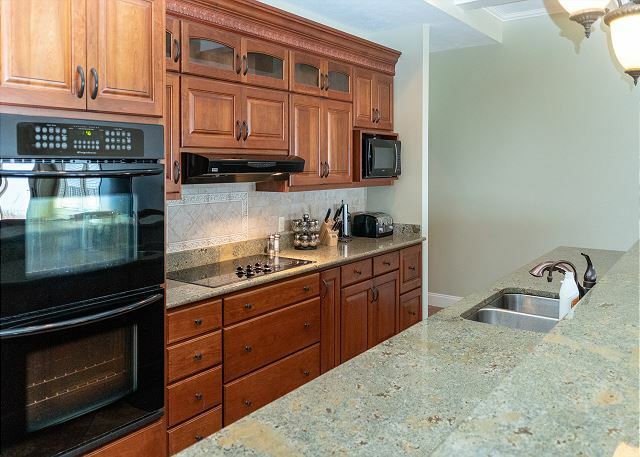 Enjoy the amenities of this beautiful kitchen but don't miss out on the fun happening around you--it's centrally located and open to the living room and dining area. This kitchen is fully stocked with everything you need to cook up a delicious meal. 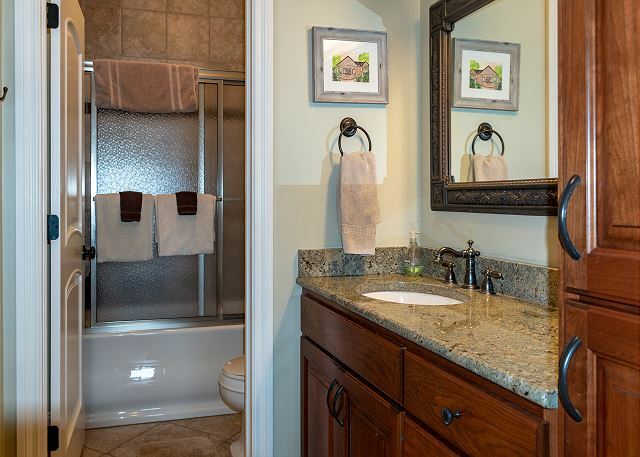 This beautiful kitchen has granite countertops, double oven, and separate counter-top range. The living room and dining room is a nice open space to enjoy a family movie night in front of the fire, or game night at the table. There is no shortage of beautiful views from the living room of this home. 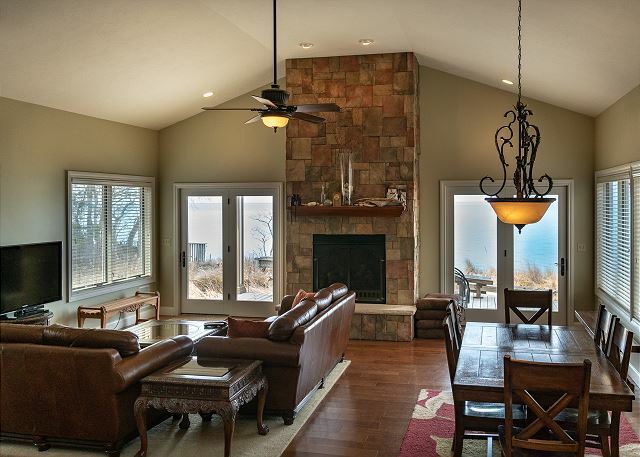 Access the deck and beach from the large french doors on both sides of the fire place. 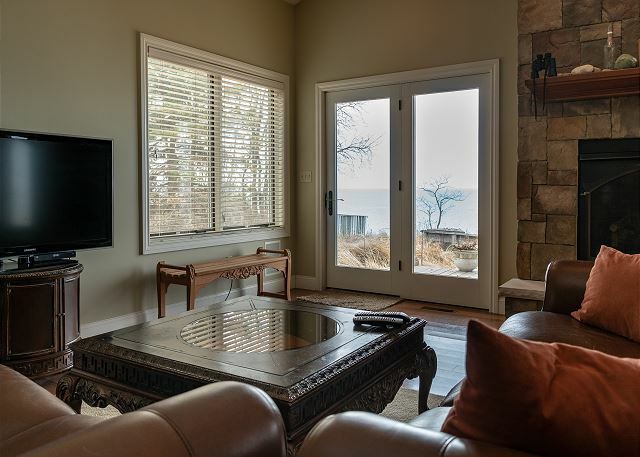 You can enjoy the beautiful views of Lake Michigan from any seat in the living room! 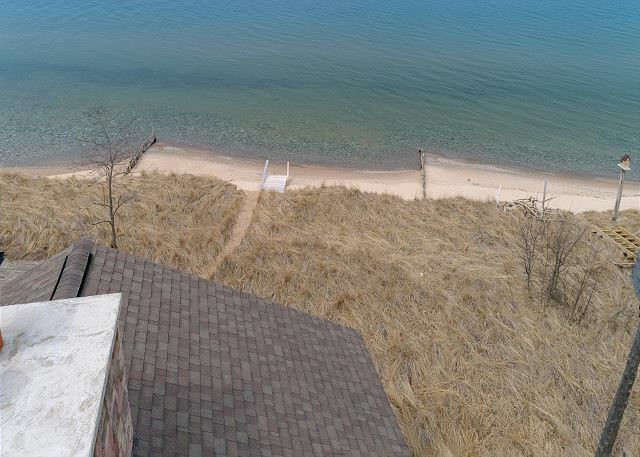 The Master Bedroom has it's own access to the large deck and views of Lake Michigan. 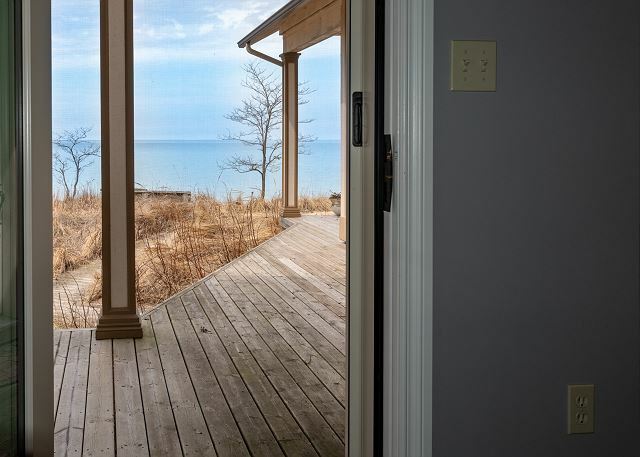 Views of Lake Michigan from the Master Bedroom. The large Master Bathroom en suite with jacuzzi tub, and his/her double vanity. 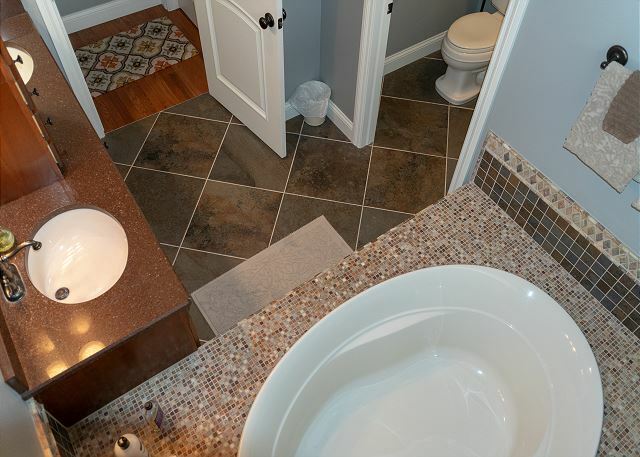 Aerial view of the large Master Bathroom with private toilet room. 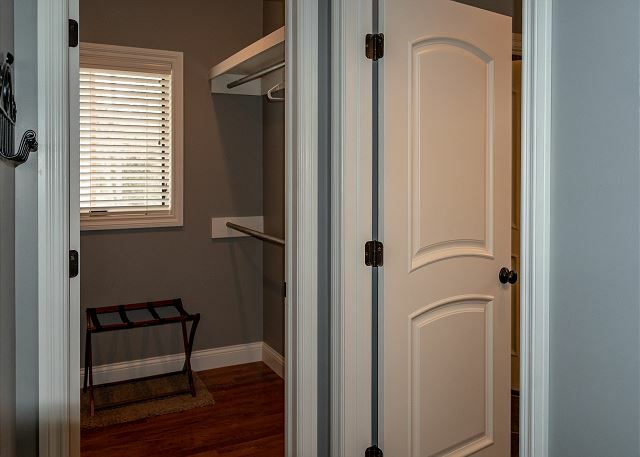 You won't be short on space with the large Master Bedroom walk-in closet. Bedroom #2 has a comfortable Queen bed and large closet. This simple, yet elegant bedroom is as comfortable as it appears! 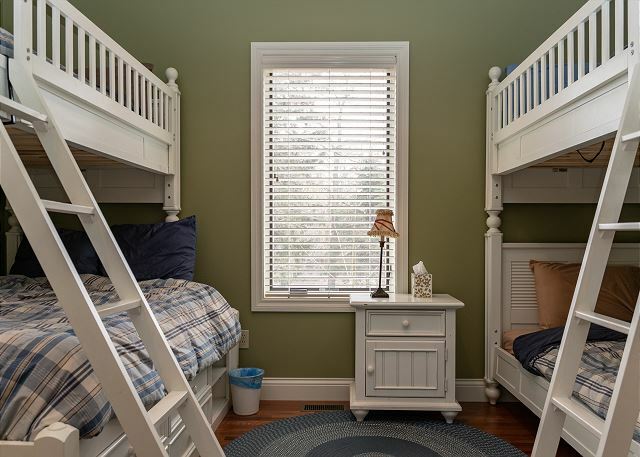 Kids will love this Bunk room with two sets of Bunk beds! Sleeps five with a twin over twin and a twin over full. This bedroom is a kids dream come true! 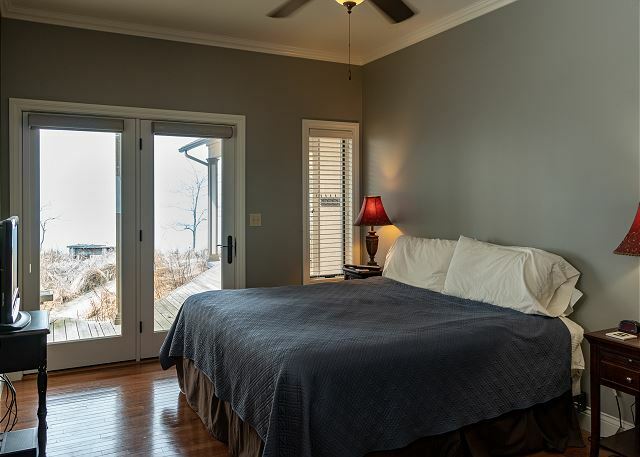 This adorable bedroom has views of the lake and a comfortable Queen bed. 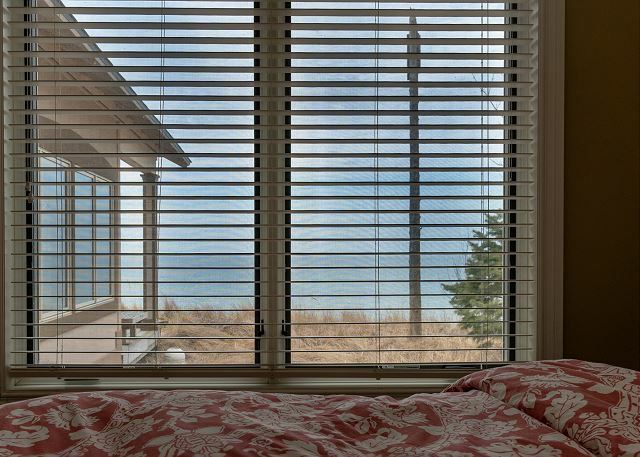 Wake up to beautiful views of Lake Michigan in this Queen bedroom! 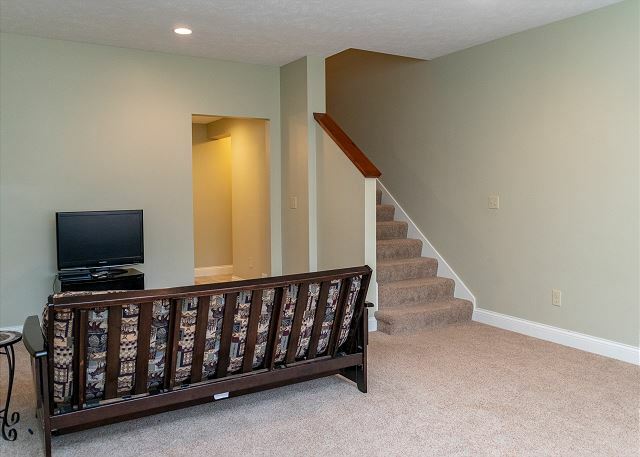 This open rec room makes a great extra bedroom. The futon functions as a couch during the day and a bed at night. 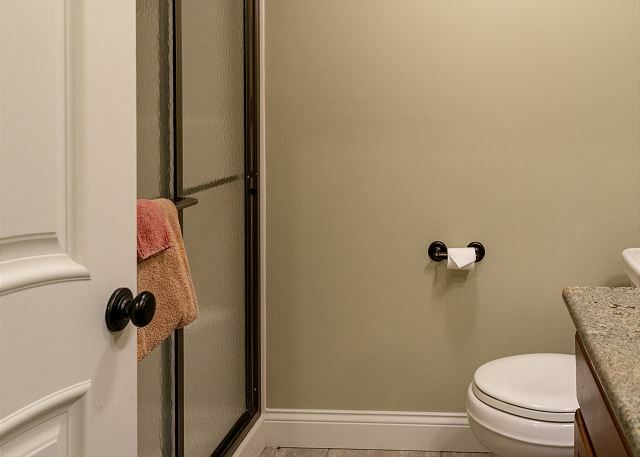 Another full bathroom is found through the door. Another full bathroom found downstairs. 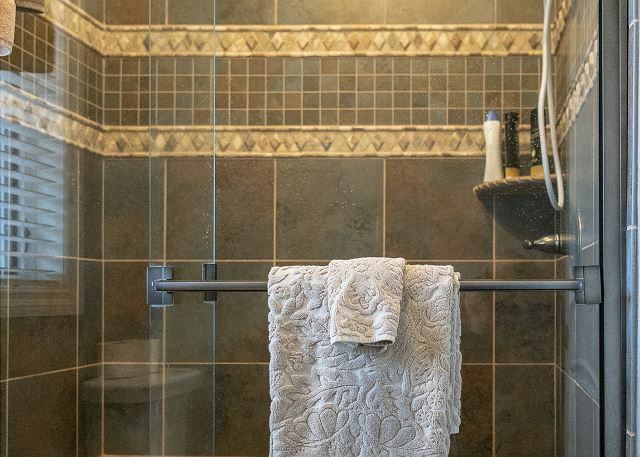 A stand-up shower in the lower level bathroom just off the main rec room area. 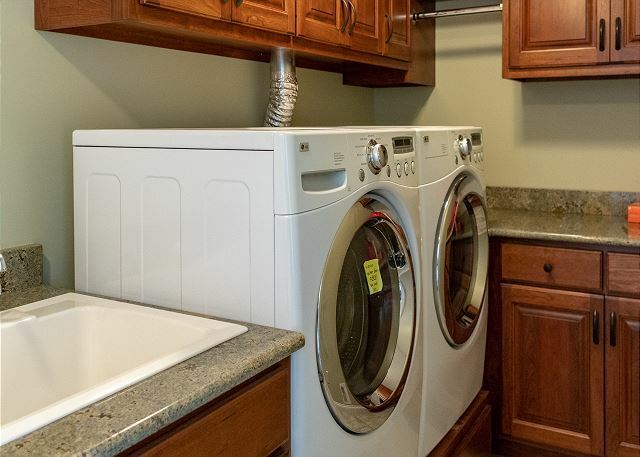 The laundry room located in the lower level is complete with a utility sink and high efficiency, large capacity washer and dryer. The back side of the home has an amazing wrap around deck for you to enjoy both the sunrises and sunsets you will surely witness at the Tuscan Rose! Lake Michigan views from the back deck of the Tuscan Rose. You won't believe how spoiled you will become by simply walking outside and already being at the beach! As far as you can see, beautiful Lake Michigan and endless blue skies. The boardwalk on the side of the home makes it easy to transport kayaks, paddle boards, and other fun toys down to the water. 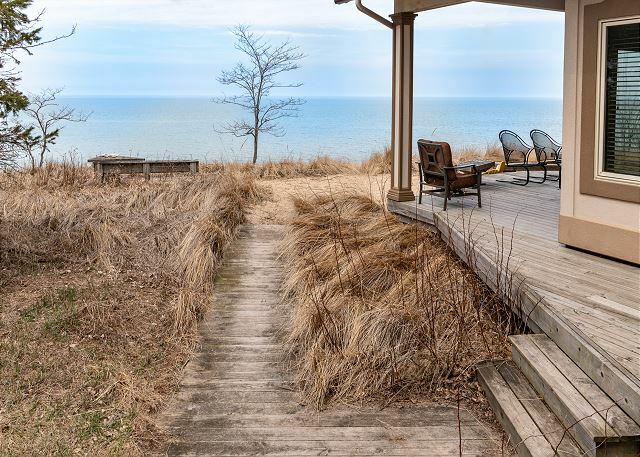 There's a lot to love in this Lake Michigan home. 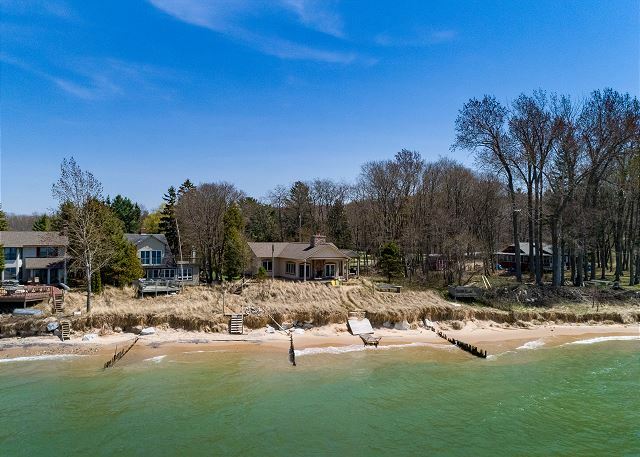 You'll be spoiled by the beautiful views and easy access to the lake with double french doors off the living room and a beautiful brick fireplace, enjoyed from both inside and out. With main-floor bedrooms and living, you'll enjoy lots of family togetherness, but yet the home is very spacious. 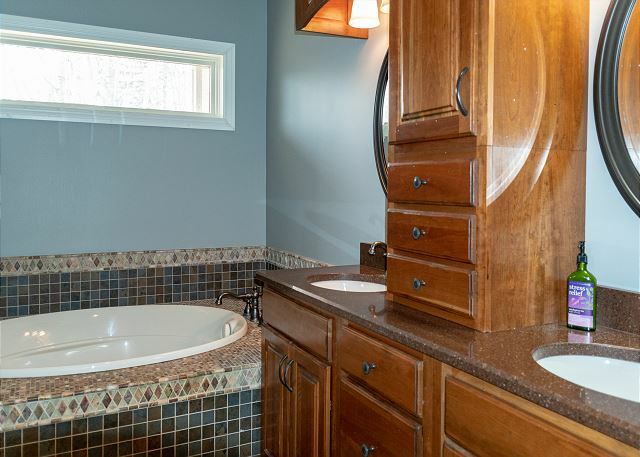 The large master suite with it's own full bathroom features a jacuzzi tub and his/her sinks, along with a large walk-in closet. The kids will love the bunk room with two separate bunk bed units, including a twin over twin and a twin over full. Create a delicious meal in this high-end kitchen with double oven and enjoy a family dinner with plenty of seating for everybody! 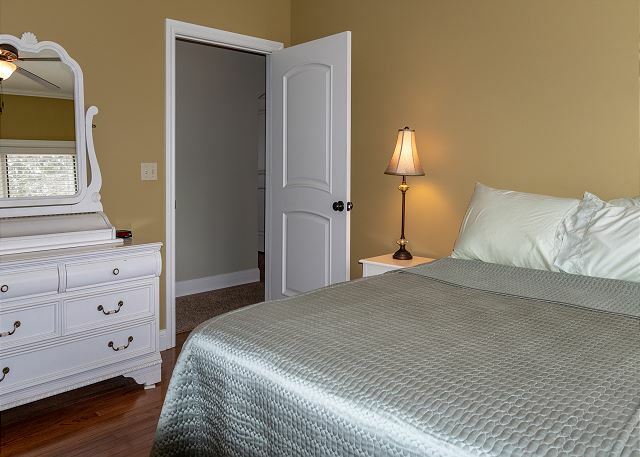 The lower level offers additional sleeping with a futon, another flat screen tv and private full bathroom. A full laundry room is also located on this lower level. You'll love the convenience of walking out the door and already being at the beach! With plenty of extras, like beach toys, stand up paddle boards and kayaks, you can easily make a day of soaking in the sun. After a day at the beach, rinse off the sand in the outdoor shower, grill up some dinner and relax on the large wrap around deck and watch the sun go down. Don't let your day end there though, wind down with your beverage of choice by the outdoor fireplace. Parking: Parking is provided for four vehicles. Two in the attached, two stall garage and two more in the driveway. The home sleeps 10. All bed linens and bath linens are provided. This high-end kitchen comes fully stocked for you to be able to prepare gourmet meals right in the comfort of your home. The dining table seats six and is conveniently located between the living room and kitchen in an open floor plan, with a breakfast bar just adjacent to the table with seating for an additional five. 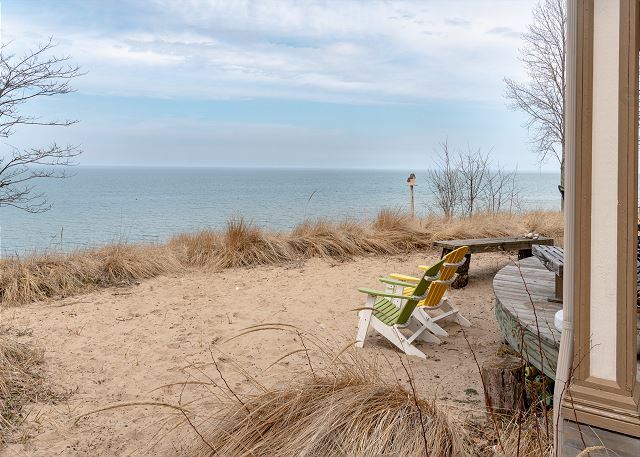 There's no better spot to experience Lake Michigan than from a private, well maintained beach. No fighting crowds, no paying to park, no waking up early to get the good spot. At Tuscan Rose, just walk out your back door and you're there! Take strolls down the shoreline and play at your own private beach all day long. 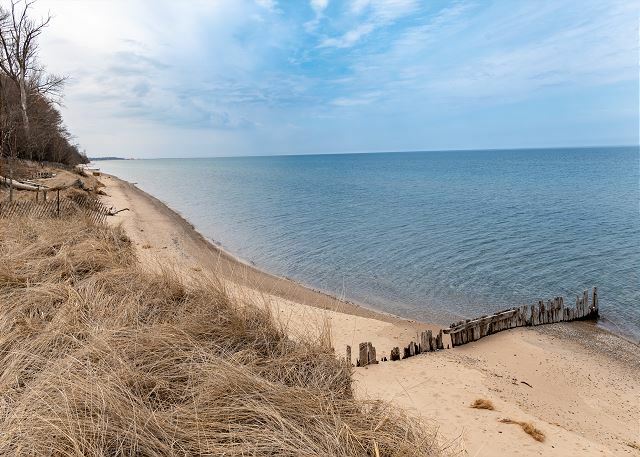 Should you decide to venture outside of your own slice of paradise, Downtown Manistee offers many restaurant options, including a new Brewery, shopping, and a beautiful river walk alongside the Manistee Channel. We thoroughly enjoyed our stay at the Tuscan Rose house! We spent time on the beach fishing and looking for sea glass as well as walking along the beach in the morning and in the evening taking in the spectacular sunrise/sunset. The house is very well appointed and was very comfortable when we settled in for the night. We enjoyed the fireplace (inside as well as outside) and had the opportunity to experience some gale force winds while we were there which was awesome! We traveled to Traverse City and climbed sand dunes as well as sampled local cuisine. This house was just perfect and we are already talking about coming back and bringing friends/family! Absolutely Beautiful House and Beach! Our stay at Tuscan Rose was Excellent! The House was absolutely Beautiful! Extremely Clean and stocked with everything. Stayed at many rentals before and this one was the best! Loved the fireplace on the deck for late night bonfires. Looking forward to coming back! This was an awesome experience for our family. Everything from the time we opened the door until we closed it on the day we left was perfect. Thank you! 2018 was our 4th year renting the Tuscan Rose. Perfect location, perfect house, perfect everything. The owners obviously put a lot of thought and care into their lovely home. The design and layout of the house is geared around family gathering and views (and sounds) of the lake. Perfection! Unsalted Vacations was easy to work with. Overall great experience. Hi Shaira - Thanks so much for this feedback! The Tuscan Rose is an amazing place, so glad you and your family have enjoyed it these last 4 years. We hope to have you back again very soon.